Hi Everyone! Hope you had a great weekend! Mine turned out slightly different than planned. Friday was a lot of fun. One of the interns in the Office of Legal Affairs invited me out to meet some of her law school friends. Megan went with me and we had a great time! Between the six of us, we had California, Minnesota, New York, North Carolina, and Virginia represented! Saturday was really hot outside so I decided to take it easy. I spent some time looking through my guide book and decided I wanted to go to Mass at St. Matthew’s Cathedral, the same cathedral where JFK’s funeral service was held. I left my dorm thinking I had given myself plenty of time to walk there. However, the address I had written down was incorrect and it was further than I expected. I was relieved when I finally made it on time! The cathedral is beautiful and everything was good for a while. Unfortunately, I started not feeling well after about 40 minutes and I actually fainted; I fell into the aisle and didn’t even know it! All I remember was struggling to sing one of the responses because I felt so disoriented and the next thing I knew there were five people standing over me! I remember asking someone if I had fallen down because I was so confused about what was going on. Looking back, I guess I was pretty lucky to faint in church compared to anywhere else in the city! Everyone was so kind and made sure that I was okay. The family sitting next to me in the pew gave me a bottle of water. A nurse brought me a cold, wet paper towel. After communion, the woman in front of me turned around and handed me a granola bar. When I was leaving the cathedral, a group of girl scouts invited me to dinner with them. However, since I had made dinner plans with Megan already I wasn’t able to go, but it was such a nice offer! A woman even gave me money for a cab and the usher called one for me. I was definitely shaken up after that experience, especially because my family is so far away, but I did not feel alone. I am so thankful for everyone in that church Saturday that looked out for me. This experience is proof that there are good people in the world! I’m pretty sure that the heat just caught up with me though. I’ve never done well when it’s hot out, so I’m just going to have to be more careful this summer. So after the excitement of Saturday, I took it easy on Sunday. Megan and I went to brunch and then checked out the local grocery stores. CJ invited me to dinner Sunday evening. His sister Kisa made an excellent meal and it was so nice to be with friends from home! 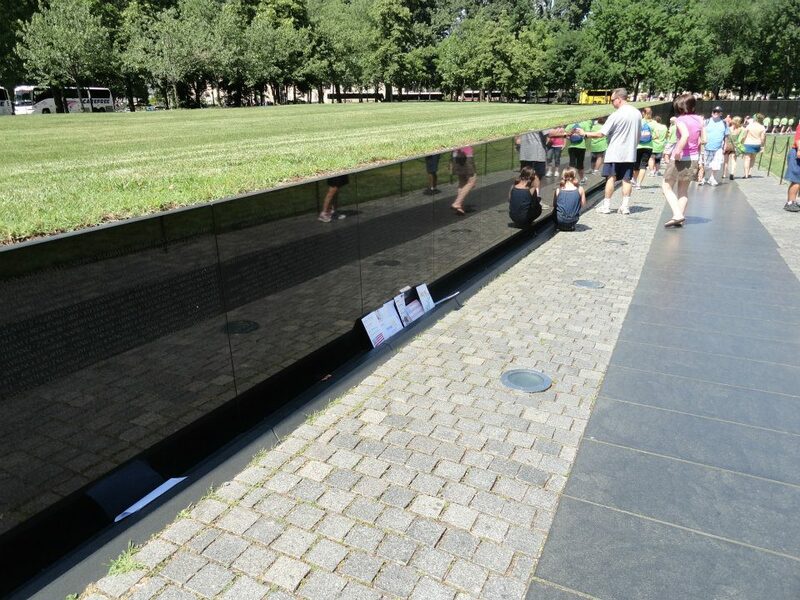 Since I didn’t have a lot of picture taking opportunities this weekend, I’m including a picture my sister took of me at the Vietnam Memorial last weekend. I promise I’ll have more pics. to come this week! ← Week one is almost done!